I don’t give much thought to pasta or bread in the summer but, come the first cold days of winter, I turn into a carbohydrate-seeking fiend. My head begins spinning with thoughts of homemade bread, saucy pasta, pastries (especially of the Eastern European bent) and buttery cookies. Once the mercury hits 40 degrees, I prepare to hunker down (and, sadly, fatten up) for the cold months that lie ahead. In the pasta department, I am as much a fan of red sauce and spaghetti as the next person. But over the years I have discovered hearty and unexpected pasta dishes that lure me when I have a little time to cook. Carbonara is king and sometimes stars at Christmas. But it is not the only game in town. And given its heart-attack inducing ingredient list, it really is not something I can have every night. Instead I look to two satisfying entrées that I discovered while traveling in Italy. Hailing from the south, the dishes (one quick, the other a bit more time consuming) renounce tomatoes for ingredients more typical to the arid region: pistachios and garbanzo beans. Nutty, salty and cheesey, the end results hit all of my comfort buttons and are a perfect countermeasure to a blustery night. The second dish is (I was told) from Puglia and definitely shows off its southern roots. After first having it in Rome ages ago, I have spent many an evening attempting to recreate it. This pasta features garbanzos, some whole, the others mashed. The legumes are complimented by fried bacon, arugula, onions and garlic, slow-cooked to a thickened sauce, into which chunks of mozzarella and hot pasta are stirred. 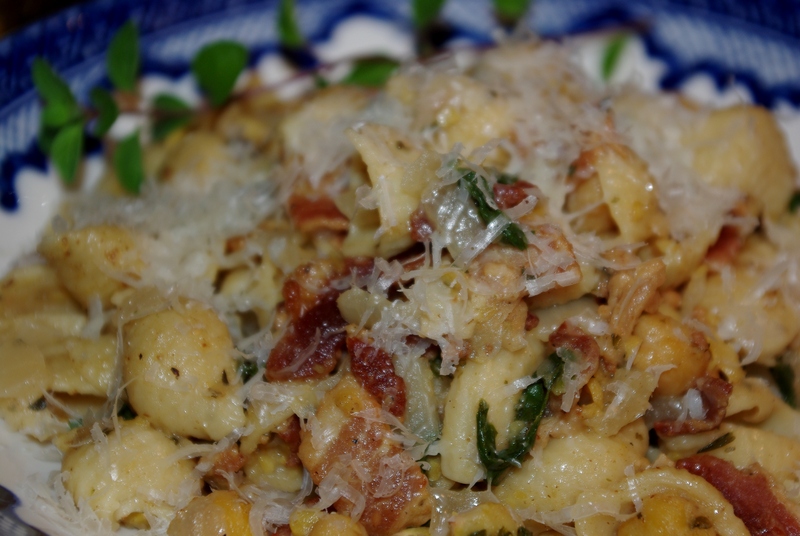 Showered with grated Parmesan, it is steamy, triple-nutty (from the arugula, Parmesan and garbanzos) and rich. As a bonus, it also is mostly healthy. The garbanzo pasta is on the menu tonight, in vegetarian as well as the original carnivore version. Humble yet celebratory, like so many Italian dishes, we will share it as we celebrate the arrival home of old friends for the holidays.